DC Structures built its reputation by designing horse barns and barn-style homes, but what about spaces for your non-equine four-legged friends? Our repertoire of projects consists of countless structures that were created to help equestrian enthusiasts care for their horses. Oftentimes, however, horses aren’t the only animals our customers own. 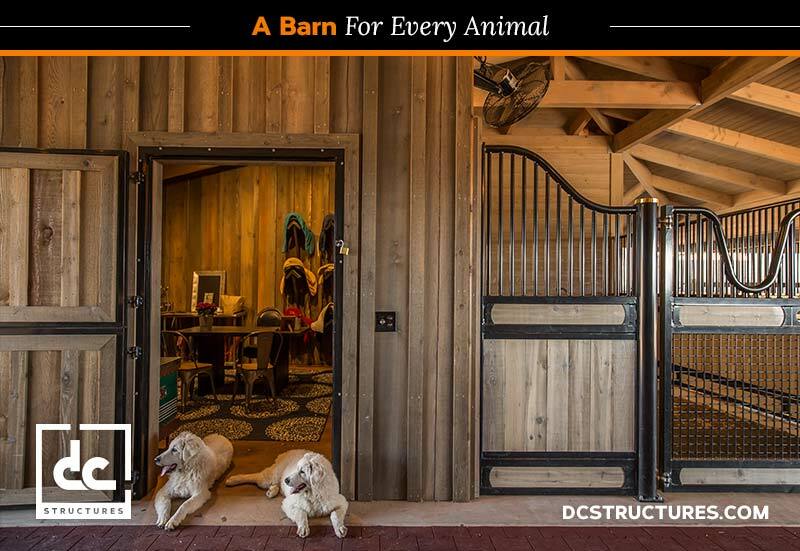 That’s why DC Structures also designs animal barns with features for all kinds of livestock and pets—such as donkey pens and dog kennels. Whether you care for donkeys, goats, llamas or anything in between, DC Structures has options to fit your lifestyle. From custom stalls and wash bays to innovative approaches to design that match your animal’s needs, there are thousands of solutions and possibilities. Our most frequent non-equine animal request is for dog kennels, which makes perfect sense considering dog is man’s best friend. Just like horse lovers care for their riding companions, dog lovers care deeply for their canines. Dog owners want the very best for their pets, and DC has the experience and ability to provide it. For example, this Powell barn kit has plenty of space and customizable options to accommodate the kinds of animals you care for. The bottom level of the barn is designed as an open workspace, and it can be modified to become a kennel barn or to include stalls for donkeys and goats. Exterior additions can also provide your animals with a place to roam outside. With an additional raised center aisle you’ll also have plenty of personal space right near your animals. The best part about designing a custom animal barn with DC Structures is knowing that you’re getting top-of-the-line quality for both you and your animals. Our building kits are not only comfortable and efficient, they are also assembled with the finest craftsmanship, guaranteeing its longevity. We understand that your pets and animals are a part of your family, and deserve the same level of comfort that you expect. No matter what your barn is for—Dogs, cats, goats, donkey, llamas or any other kind of animal—DC Structures can provide exactly what you need. Request our digital catalog and start planning the perfect space for you and your animals toll share.